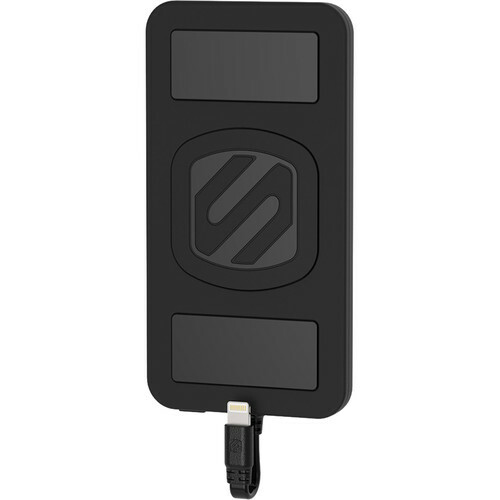 Slim, stylish, lightweight, and powerful; the black Scosche MagicMount PowerBank Lightning 4000mAh Battery Pack provides 4000mAh of power in a portable, compact design. Fasten the included metal MagicPlates to your device and the MagicMount PowerBank will safely attach to both via its strong, rare-earth magnets. With 2.1A of power output, you'll be able to charge your iPhone while on the go. Please note this product is not for use with any devices that use hard disk drives, as the strong magnetic field may cause damage. The internal 4000mAh rechargable lithium-ion battery can charge a dead iPhone 6 or iPhone 6s up to two times, thanks to its 2.1A power output. The MagicMount PowerBank comes fully charged right out of the package and has an LED indicator to quickly check out how much juice is left. These powerful, rare-earth magnets hold your device securely in place even on the bumpiest roads and are 100% safe for smartphones, tablets, GPS, and other mobile devices. Please note that they do not work with any devices that use hard disk drives. The magnetic fields produced by these neodymium magnets are strong enough to damage hard drive devices. Box Dimensions (LxWxH) 7.8 x 4.1 x 1.8"
MagicMount PowerBank Lightning 4000mAh Battery Pack (Black) is rated 4.2 out of 5 by 20. Rated 3 out of 5 by Pauling from Final Updated Review My first review stands. After getting two full charges for my iPhone 8 just on one occasion, I no longer can get two full charges. And this is starting at 20-30% battery capacity on my phone. Sorry for leaving multiple reviews but I think its important for consumers to know the products limitations. Rated 5 out of 5 by Kevin from Great Little Addition to Battery Life It's not for IPhone X - but it is a grand addition to our flexibility with our older (Lightning Connected) IPhone. The previous generation(s) of "chargers" were cumbersome - this one is quite slick. The magnetic connectable device about doubles the weight of our IPhone 6s - but is very compact. We just love it. Rated 4 out of 5 by Brian from Nice and compact! I bought this because it was both magnetic and had an attached cable for my iPhone. It's great to have the battery pack "stick" to the back of your phone and to not have to look for a cable. Although, I wonder how long this attached cable will last. Seems like it's a bit flimsy. Rated 1 out of 5 by Mike from Problems with the design The poor lightning plug has to be positioned just so and not jostled to keep a connection. Meaning you probably wont want to put it in your pocket where the wire loop is extending out an inch and easily moved. Also know that you have to stick an ugly adhesive-backed piece onto your phone so the batterys magnet will attach. Best to pay a bit more get one of the battery pack/holders that wrap completely around your phone instead of magnetically piggybacking. Rated 3 out of 5 by Chad T. from Underwhelming Overall, I'm pleased. However, the magnet is underwhelming. Do not expect it to work well with cases that have anything other than a completely flat surface. I have a Magpul case and it definitely likes to move around on the case's back. It's handy in a pinch, but I find myself only using it for short period of time. Just long enough to get me a quick charge til I can find a plug. Rated 5 out of 5 by Kim from Exactly what I was looking for This battery pack is exactly what I was looking for. The slim profile fits well in my purse. Attaching it directly to my phone with the magnets makes it very easy to use while I'm walking around and actually using my phone. Love not having to deal with long cords, or remembering to bring a cable. Rated 5 out of 5 by Robert from Awesome Little Piece Out in the country, left an app open on my phone and all of a sudden I am down to 2%. Plugged this puppy in and was back to 88% in a half our or so (iPhone 7). Keep in mind this device has a switch to turn it on and off. Magnets seem to work ok too. Will the magnetic mount work through a thick phone cover? As per the manufacturer this will only work with a thin case, however if you place the peace of aluminum outside of the thick case then it will work the best. Will this charge a iPad pro? Will it charge a samsung note 8?